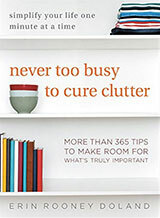 House Beautiful: What’s in your junk drawer? Recently, I received a fun request from House Beautiful magazine to share a photo of my home’s junk drawer with their readers. Somewhere in every home there’s the bottomless, fascinating, slightly terrifying junk drawer. It’s like a little attic. Truth be told, I don’t have a junk drawer in my house. I have just two built-in drawers in my entire place, and they’re in the kitchen. 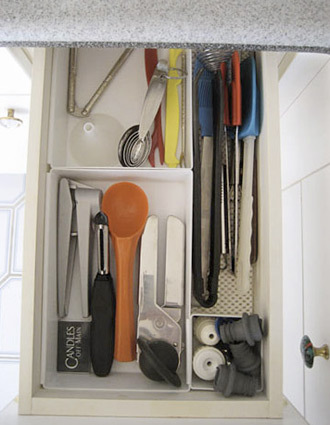 One of the drawers holds eating utensils and the other holds food preparation utensils. Which, unfortunately, I believe made me the least fun of the 8 “brave souls” featured in the article. I like your collection of wine stoppers. The lower is really colorful. I started thinking about the tyranny of the junk drawer when I was getting rid of my clutter. Mine ended up being a way for me to avoid making a decision about what to do with random things like twist ties that I felt badly about just throwing away but ended up never using. Instead of finding a place for things (including the trash can), I put them in the drawer. 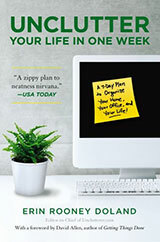 Do more organized people, like you, avoid the junk drawer concept altogether? It sounds like it. That’s not a junk drawer, Erin! It’s a nicely organized kitchen drawer. I went to the House Beautiful website and I didn’t see one junk drawer. 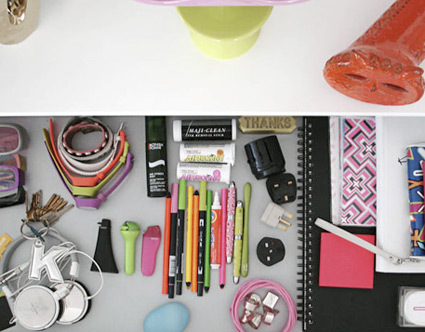 A junk drawer is a mishmash of weird items (that are generally useful) that are all jumbled together in a messy heap. This drawer is generally in the kitchen. I don’t have a junk drawer either but we had one growing up. It had all manner of tape in it, misc. sewing notions, string all wrapped around screws and bolts, floral tape, pencils of all varieties, pens that didn’t work, screwdrivers, rose food, crayons, cake decorating stuff, pet collars, flea medicine, tape measures, letters to my Grandmother, appointment reminders. You get the idea. And this drawer NEVER got organized! All in all it was a neat drawer to comb through when I was a kid. A good junk drawer is like an archeological dig. Three more things that were always in that junk drawer from childhood: scissors, batteries and every glue imaginable. Impressive. Karim Rashad must open his junk drawer very slowly. One of my decluttering clients had the best name for this sort of storage place – ‘The useful drawer’. Am I missing something? How do the pens and other round objects in the second picture stay in place? And do I see a Tide Stain Stick without a lid? Ditto @Homer. That was my first thought. The first time I opened Karim’s drawer, his stuff would look like what a junk drawer really is. @Alisa — From your description of the junk drawer, I thought maybe we grew up in the same house, until you listed the pet collars and flea medicine. (Although if we’d had pets …) Instead, we had the mini-stapler and the staples that didn’t quite fit. I talked with organizer Justin Klosky from the O.C.D. Experience (www.ocdexperience.com) recently, as he came and gave me a free consultation, and said to me that it is indeed OK to have one junk drawer in your home, but it should be organized and clutter free. A suggestion he had was to dump out the drawers in your home that were “junk drawers” and then sift through the things that you actually needed and used, bring them to the one main junk drawer and discard the remaining items that were truly junk. I took his advice and now my junk drawer is clutter free, usable and continues to stay that way since I empty it out now once every few months and do not have any other drawers for junk..